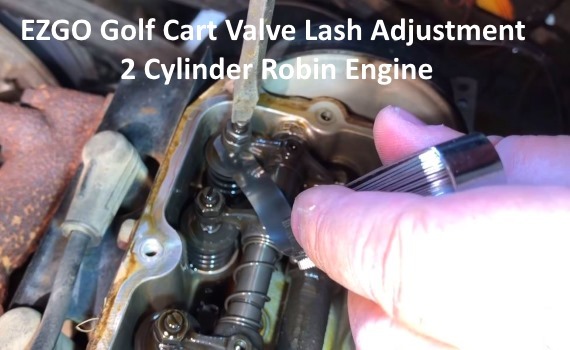 How to adjust the valves in a 2 Cylinder Robin Engine EZ-Go golf cart with a feeler gauge. Adjusting the valves on these small motors are relatively easy to do with a little knowledge. Just follow the steps below. Start with a cool engine for clearance and safety. Remove the 6 valve cover bolts, and pry off cover. Choose a valve to start. Turn cam lobe down by rotating drive clutch by hand. Loosen adjuster lock nut 1/4-1/2 turn. Insert .004″ feeler gauge between cam, and lifter. Turn adjuster until feeler gauge has very slight drag, but is free. Steady the adjuster with a screwdriver, and tighten lock nut. Then re-check with feeler gauge again. Now, do the same for the remaining valves. The middle two are the intake valves. Re-install cover. Tighten bolts to 5 ft/lbs. Thanks to Tuber “BCtruck, rebuild, repair,repurpose” for the video. As with all repairs do at your own risk. Be very sure of what you are doing as to not damage your motor. You can find more EZGO parts and accessories here for your golf cart. 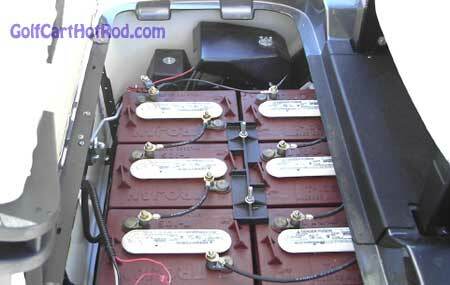 Should I always keep my golf cart charged up all the way ?